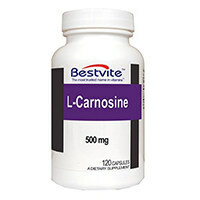 This is our list of the best selling carnosine supplements on the market right now. These 10 l-carnosine brands have been ranked because they dominate the e-commerce sales charts, fitness bloggers love them and they have the highest user reviews online. This version comes in a package of powder. Different packages contain different amounts of protein. Most options come in 25 g or 50 g or 100 g.
A 500 mg dose is considered standard, though. It is free of soy, yeast, gluten, corn, and additives. Tips on the package indicate that while this supplement is water soluble, it does dissolve rather slowly. It can be dissolved in either water or juice for consumption, though. Storage restrictions claim it should be kept away from heat, light, and moisture. This version comes as a pill, and most packages come as 100 pills in a bottle. Pill dosages are 500 mg per pill, and one pill should be taken twice a day. This particular variant is an L-histidine. While it also contains cellulose, stearic acid, and magnesium, it is free from sugar, salt, starch, yeast, wheat, gluten, corn, soy, milk, eggs, shellfish, and preservatives. It is also considered to be a vegetarian and vegan product. 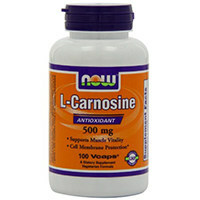 Once more, this capsule contains 500 mg of L-Carnosine. It also contains 50 mg of Vitamin B1, 50 mg of Benfotiamine, and 4 mg of Luteolin from orange fruit extracts. Other ingredients include cellulose, rice flour, ascorbyl palmitate, and silica. Dosages suggest taking one capsule two to three times a day for the best effect. There are 90 pills in a bottle, so it should last for about a month. It is also vegetarian and vegan-friendly. This product comes with 120 capsules in a bottle. PepZin GI a complex of the mineral zinc and l-carnosine. PepZin GI was developed in Japan and has been in widespread use there since 1994. 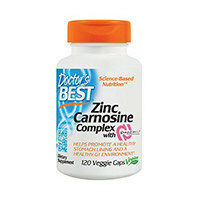 It contains 16 mg of Zinc, 45 mg Zinc-L-Carnosine Complex, and 59 mg of L-Carnosine. It also includes microcrystalline cellulose, modified cellulose, magnesium stearate, and silicon dioxide. Two capsules should be taken daily during or after meals. This product also comes in a pill form. It contains 88 mg of Calcium and 500 mg of L-Carnosine. Other ingredients include dibasic calcium phosphate, microcrystalline cellulose, stearic acid, hydroxyproyl cellulose, silica, and modified cellulose gum. One capsule should be taken one to three times a day with meals. Women who are pregnant, or could become pregnant, and who are breastfeeding should consult a doctor before taking this supplement. 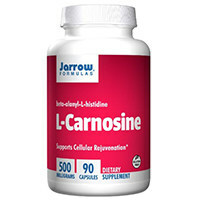 Jarrow’s L-Carnosine comes in a capsule form. There are 90 capsules in each bottle. It does not contain wheat, gluten, soybeans, dairy, egg, fish or shellfish, or peanuts or tree nuts. 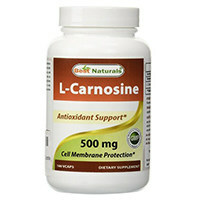 It contains 500 mg of L-Carnosine in the form of beta-alanyl-L-histidine. Other ingredients include cellulose, magnesium stearate, and silicon dioxide. If you have a medical condition, are pregnant, lactating, trying to conceive, under the age of 18, or taking medications, consult your healthcare practitioner before using this product. This bottle contains 100 capsules at 500 mg per capsule. One to two capsules should be taken daily with food. The manufacturer claims this product is of the highest quality to the point that all suppliers of their product have to certify that its ingredients come from raw material. This bottle contains 120 capsules at 500 mg per capsule. It contains L-Carnosine as beta-alanyl-L-histidine at 500 mg.
Other ingredients include a gelatin capsule and glycerol esters. It does not contain artificial colors, starch, salt, wheat, soy, corn, milk, eggs, or preservatives. Does not contain any added fillers. It is manufactured in the USA by an FDA registered facility. Every batch claims to be laboratory tested. It also claims to contain top rate ingredients. This product does not contain magnesium stearates. This bottle contains 60 capsules for cellular rejuvenation. The company claims the product is vegetarian-friendly. 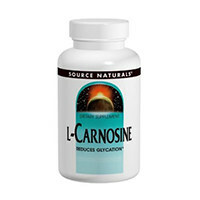 This product comes with the finest quality Japanese pharmaceutical grade L-Carnosine. It comes in a beta-alanyl-L-histidine form. It removes heavy metals, free radicals, and active sugar molecules from the body. Each serving is two capsules once a day. 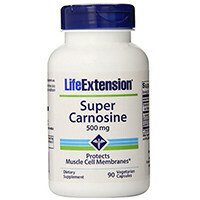 Each capsule contains 500 mg of L-Carnosine. The only other ingredients are the capsule holding the supplement. It does not have fillers, binders, or common allergens. This product contains 60 capsules that are hypo-allergenic. The brand recommends taking one to three capsules per day in divided doses between meals. Does not contain wheat, gluten, egg, peanuts, coatings or shellacs, GMOs, magnesium stearate, trans fats, hydrogenated oils, binders, fillers, preservatives, and artificial colors, flavors, or sweeteners. The manufacturer claims to clearly label any product by their brand that has these allergens, but this product is not labeled with any of the allergens above. First of all, the quality of ingredients in the supplement has to be considered. They have to be high-grade ingredients that are found in abundance in a product. They cannot be a small amount or poor quality, or else they will not perform well in the body. To find out which supplements have the best levels of carnosine, be sure to pay close attention to what labels do and do not say. 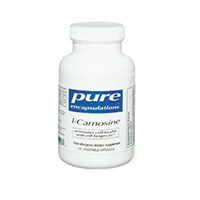 Labels containing carnosine should be specific as to the type being used and the amount placed in each dose. As far as dosages go, pay close attention to what the daily recommended dosages are. 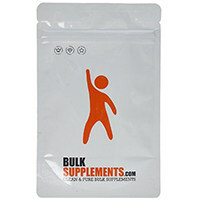 There has to be enough of this supplement taken to allow it to build up in the body. 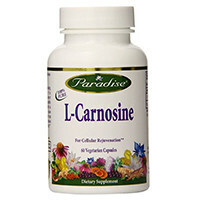 To consume carnosine effectively, it should be either taken as a pill or be consumed as a tea. Most people take it as a pill or as a powder that can be added to foods or drinks.